Those of us working on children’s issues know that investing in high-quality early learning for young children pays off over the long run, with better academic performance in school, increased rates of employment, and decreased involvement with crime. Less well known are the impressive short-term benefits of early learning for the local economy. For every $1 invested in early care and education in Illinois, an additional 94 cents are generated, for a total of $1.94 in new economic activity in the state. This strong economic boost for local businesses is higher than investments in other major sectors such as transportation, retail trade and manufacturing. This strong economic boost for local businesses is higher than investments in other major sectors such as manufacturing ($1.79), transportation ($1.91) and retail trade ($1.93). While investments in any industry generate additional economic activity, what’s impressive here is that the early learning sector has one of the highest “multiplier effects” in the local economy compared to other major sectors. Although the figures cited here are specific to Illinois, the same general pattern holds true across the country, with the early learning sector at or near the top compared to other major sectors. 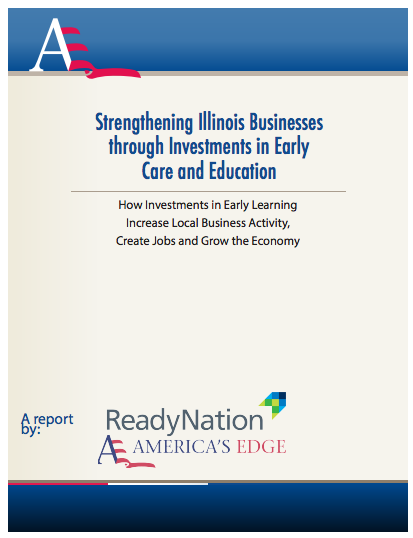 Early learning promotes economic development. Not only does it help kids get the right start in life, it generates additional economic activity in the local economy which benefits businesses and our communities. When policymakers are faced with tough budget choices, its good to know that early learning is an investment that can help children learn, help parents work and help grow the economy. The press release for the report.